This is a very special week since the Coursera Gamification course has just started and it seems EPIC! (Join us here: https://class.coursera.org/gamification-002/class/index). So everyone is talking about Gamification, a weird word that seems to have been made up to get all of our problems sorted, and it´s all about games! But what is Gamification? 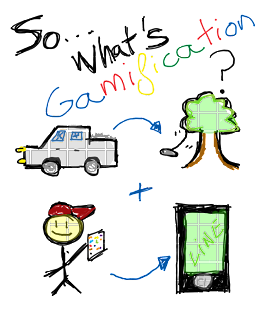 "Gamification is the use of game mechanics and dynamics applied to a non-pure gaming environment to achieve a goal"
In a very simple way to explain it: It´s like taking some pieces out of a car (wheels in this case) to use them as a swing for your kids. They´ll still be car parts but you use them in a different way to make your children have fun! So, in overall and briefly, this is gamification! and it´s a whole new (or old if we look at the ancient Greece and their war games) world but lets have a global view of the schedule of the blog! I´ve created 4 sections in which i´ll talk about those topics and all the elements involved around them. First of all, the psychology of gamification is explained through 2 parts to start talking about the 4 Ws of gamers, that settled the base of everything. Afterwards, the basic elements of gamification are analysed in detail and as well as many other game mechanics, dynamics and aesthetics, that would be described with real and practical examples! Since this is mostly a business blog, the art of gamification in business will be discussed, and i´ll also talk about other real world examples that are working out nowadays (some are them are EPIC). More parts will be added but for now this is the schedule! With each new blog i´ll be giving some referencing, key books or materials to read or watch (like TED videos) but if you want to know more just email me (victormanriqueyus@gmail.com) !!! Hope you like it and i´ll be posting next section soon!! !